Does your routine look something like this: get out of bed, get coffee, sit in front of a computer in your office, move to the living room with your laptop, grab some food from the kitchen, repeat all of this a few times, end your workday and return to sitting in the living room to watch Netflix before heading to bed? If it is, I bet a solitary tear just streamed down your cheek. Do not fret. You are not alone. While working from home either on your own business or working remotely for your employer can allow for more flexibility as well as time and money saved from cutting that commute, it can be rough. It is easy to end up at home day in and day out. 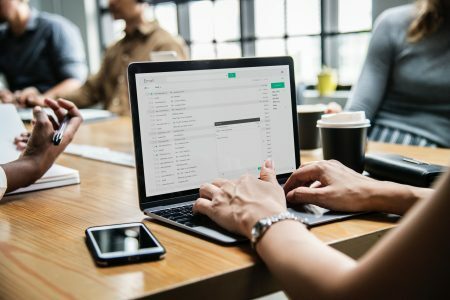 Your home becomes your workplace so even when you are off the clock, it is so much easier to fall into a pattern of checking your e-mail or making one more phone call. It is also easy when you are supposed to be working to end up throwing laundry in the washing machine, fixing the leaky pipe, or throwing on an episode of your favorite series during a quick break that turns into three episodes. The division between work and home is a healthy one. If you are tired of working at home but do not want to be in a typical corporate office setting, consider a coworking space. Coworking spaces are shared offices where members pay a monthly fee to either sit in an open floor plan at whatever table or desk is available or, for a higher fee, can rent an actual office. These places usually have all the basic business infrastructure – Wi-Fi, printers, PCs, a coffee station or kitchen, and meeting rooms equipped with projectors. Here are a few reasons why a coworking space might be right for you. 1. Human interaction One thing many people who work from home miss is the social aspect of working in-person with others, though they may not miss their cubicle. In a coworking space, you enter the building, greet the receptionist and walk past people from twenty different businesses doing innovative, interesting things before you even sit down. Chances are you chat with these people by the coffee maker and at community events that the coworking space hosts. This develops a sense of community and gets you out of your house, which was starting to feel like solitary confinement. Additionally, as someone who has been working from home, you either work remotely, own your own business, or are a freelancer. In a coworking space, everyone else generally fits that profile. You will be around the kind of people who have lifestyles similar to yours and who you may enjoy interacting with. We are social animals. Whether you are an introvert or an extrovert, we crave being around people to some degree. Locking yourself up at home except for the occasional meeting in a coffee shop or trip to the grocery store is not enough for most people. 2. Look like a business Do you have your own business? Do you usually meet clients in a coffee shop or at your kitchen table? In coworking spaces, you can invite a client or supplier to meet you in one of the conference rooms. While grabbing a coffee with a client might work if you just need to chat and there are no high stakes involved, spreading out papers and looking at a PowerPoint presentation is much easier if you have a large table, a projector and a door that closes so you can focus. You also look more professional having an office someone can meet you at and the right infrastructure like a printer and reliable high-speed internet. What do you do if you have a meeting in your living room and the internet is having issues? If your answer is to panic, that might not be the best place for your business meetings. 3. Get more clients Word-of-mouth marketing is really important for any business. If you have your own business, working in a coworking space means that more people are exposed to your business and there is more opportunity for word-of-mouth marketing to happen. Whether you provide a B2B or B2C product or service, being around businesses and individual consumers can lead your business to more customers. Even if the people in the coworking space are not your target audience, I bet they know people who belong to your target audience; and when you become a part of the coworking space community, community members help each other out and spread the word about other members’ businesses. 4. Get connected Are you looking for a new graphic designer? Do you need a little help figuring out how to make Excel do that one thing you learned but now you simply cannot remember how to do it? When you work around other professionals, chances are that if you chat with a few people, someone will give you an answer or point you in the right direction. Also, when you become a part of that community, sometimes you also get discounts or freebies or you trade services with someone rather than dishing out cash for every little service needed. 5. Skills development opportunities Many coworking spaces also host skills development workshops and as a member you will always know about them. Some coworking spaces even require organizers of such workshops to offer discounted fees for their members. When you are working on your own, it can be good to take refresher courses and make sure you are still up-to-date on different skillsets. 6. Get instant feedback and tips As you meet people in your coworking space, you will find people who know more than you when it comes to certain aspects of your business or work. Maybe you are sitting next to a social media guru and you are trying to figure out how best to make a Facebook ad. You probably cannot ask the guru to do it for you but you probably can ask them to take a quick look and offer some words of advice. I bet when you initially started working from home you thought it would be the best gig ever – working while sprawled out on the sofa, phone meetings in your footie pajamas, and endless snacks from the kitchen or even getting to cook healthy lunches every day. The problem is that what you expected it to be - or how awesome you expected those things to be – and the reality did not exactly line up. However, there is no need to worry. There are options out there that do not involve the bleak corporate office setting and coworking spaces are one of them. Coworking spaces are relaxed spaces full of other people who work independently but also do not want to be stuck at home or in the corporate grind all day every day. Additionally, as coworking spaces cater to people with flexible working lifestyles, they often offer month-to-month options or trial vouchers. Put the footie pajamas back in the drawer and try it out.